Nintendo took the world by storm in July, fans have waited eagerly for whatever changes and additions would be added to the game experience in the future. When it became clear that certain functions of the app that were teased in initial trailers (trading, battling players outside gyms) wouldn’t be implemented anytime soon or at all, interest in the game slumped save for only the more dedicated and devoted fans who continued to keep a presence. Reports of a big announcement for December 13 has gotten everybody excited for what new updates may entail: new features or new Pokémon beyond the first 151 found in “Pokémon Red”, “Green/Blue” and “Yellow”. As Polygon reports, while the details of the announcement have left active “Pokémon Go” players a tad unsatisfied, it’s still something new. The app is bidding welcome to at least eight new Pokémon beyond the First Generation, some of them from the Second Generation represented in the “Pokémon Gold” and “Silver” games on the Nintendo Gameboy Color. 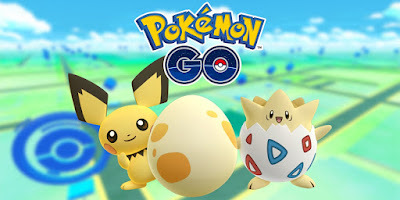 Two of the new Pokémon are especially highlighted; there’s the critter-in- a-egg Togepi whom fans of the “Pokémon” anime would remember as a “pet” of Ash’s companion Misty”, and Pichu, the ret-conned initial stage Pokémon that would evolve into the iconic Pikachu (and later Raichu). Further info reveals the identity of the other six added Gen-2 Pokémon: Elekid, Magby, Igglybuff and Cleffa. While the news of the additions has garnered great interest in players, a wrinkle was quickly pointed out by the official Niantic announcement. These new Pokémon can’t be encountered on the world map and caught. Instead, they can only be found from eggs randomly gathered at Poke-Stops throughout the game that must be “hatched” in an incubator by walking/travelling certain distances. The developers wrote in their blog post that the eight were merely the first wave of some new Pokémon to be added in the course of the following months, so that’s that too. But wait; actually that’s not all. On December 29 Niantic will also make available a rare occasional limited-time Pokémon that CAN be caught in the wild. It’s a Pikachu; the marked difference being that it’s wearing a holiday hat. Yay, I guess. Although “Pokémon Go” is holding at Number 10 among the top-grossing apps in the Apple App Store, it’s no longer present in the top downloads charts. Perhaps the new Pokémon might make some players interested in walking around again. Only time will tell.